Cupcakes are one of my favorite treats; I love them from a box mix. Homemade with generous amounts of frosting are what dreams are made of, but taking cupcakes to the next level by decorating them Disney style is like a gold star on top of perfection! 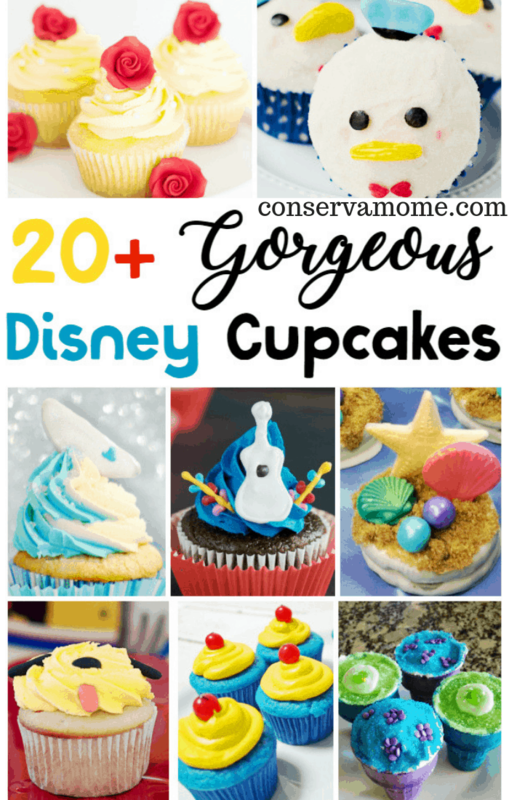 I have discovered 20+ Gorgeous Disney Cupcakes that are perfect for a birthday party, a celebration, or a way to build excitement for your next Disney trip! Can you imagine serving any of these 20+ Gorgeous Disney Cupcakes to your family and telling them that they are going to Disney? Wouldn’t that be so much fun? While these 20+ Gorgeous Disney Cupcakes look like complete works of art, which are almost too lovely to eat, the instructions given with these recipes are easy to follow and will have you decorating your favorite cupcake recipe in a way that will absolutely impress anyone you share them with! I cannot pick a favorite from this list! They are all too cute to compete! I know my kids would love it if we made any of these 20+ Gorgeous Disney Cupcakes and enjoyed them as a special treat with the coordinating Disney movie! If you are heading to Disney for your first visit soon, don’t miss this post of 10 things you need to know before your first Disney Trip.